We study several natural instances of the geometric hitting set problem for input consisting of sets of line segments (and rays, lines) having a small number of distinct slopes. These problems model path monitoring (e.g., on road networks) using the fewest sensors (the “hitting points”). 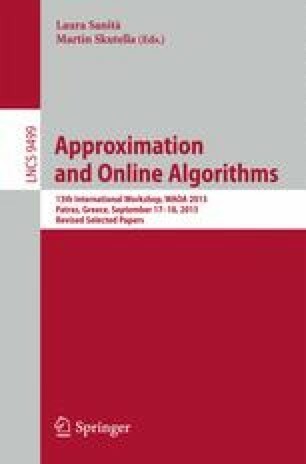 We give approximation algorithms for cases including (i) lines of 3 slopes in the plane, (ii) vertical lines and horizontal segments, (iii) pairs of horizontal/vertical segments. We give hardness and hardness of approximation results for these problems. We prove that the hitting set problem for vertical lines and horizontal rays is polynomially solvable. This work is supported by the Laboratory Directed Research and Development program at Sandia National Laboratories, a multi-program laboratory managed and operated by Sandia Corporation, a wholly owned subsidiary of Lockheed Martin Corporation, for the U.S. Department of Energy’s National Nuclear Security Administration under contract DE-AC04-94AL85000. J. Mitchell acknowledges support from the US-Israel Binational Science Foundation (grant 2010074) and the National Science Foundation (CCF-1018388, CCF-1526406).